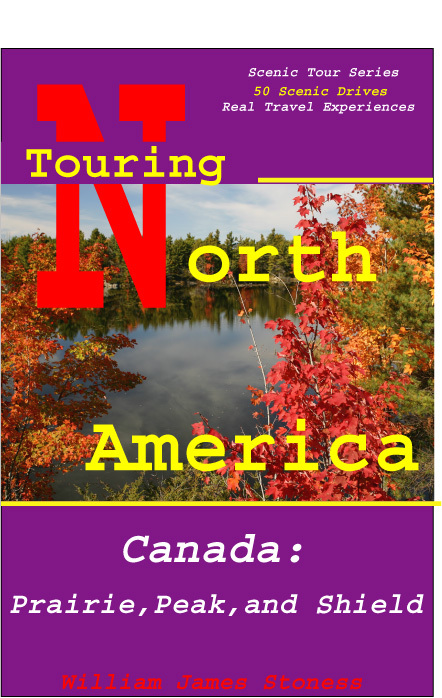 Canada: Beyond the Far Horizons, is the third in a series of books about Touring North America. The book covers Central and Western, and Northwestern Canada, from The Ottawa River west and north to Inuvik. 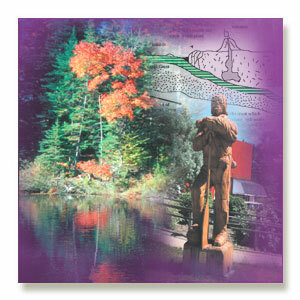 Select your trip by piecing together some of the 50 driving tours and enjoy Canada’s wonderlands. Throughout Canada: Beyond the Far Horizons you will find a few paragraphs about the early explorers because they are the people who shaped Canada’s future. Much of eastern Canada and most of the north consists of a broad area of old worn mountains called the Canadian Shield. The exposed rocks are some of the oldest rocks in the world. The continental glaciers that pushed across the and left piles of debris and a pattern of poor drainage. As a result the shield region of Canada is characterized by thousands of lakes, streams, rivers, and swamps. There are also innumerable hills, and deep valleys. These conditions made exploration very difficult. To the south, the St. Lawrence River and the Great Lakes led right into the heart of the country. This was the route taken by the French. The French created colonies and their industrious young men explored. Some small fur trading companies banded together to form the North West Company. The search for furs led to much bickering and trouble. The British entered Hudson Bay and pushed up the rivers establishing forts and fur trading posts along the way as the Hudson Bay Company. In many of the Driving Tours there will be references to early explorers, the conflicts between the two trading companies, and other historic events. In CANADA: Beyond The Far Horizons, you will find information about the things that make Canada what we see today. There will be geological information describing how what we see came to be. There will be information about the great glaciers that shaped the landscape. It will explain why iceberg scratches are visible on the flat farm land near Winnipeg, and about the small, but deep kettle lakes that dot the landscape in many places. CANADA: Beyond The Far Horizons CD is written in a manner that makes it an extremely useful book that the average family can use to select the most interesting route to a western destination. All Driving Tours are outlined on a large area map placed near the front of the book making it easy to locate a destination and select Driving Tours which go in that general direction. 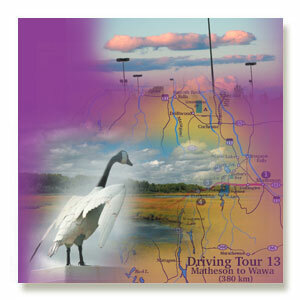 Then read each of those Driving Tours and string together those Driving Tours that you like best. Your trip is now ready. 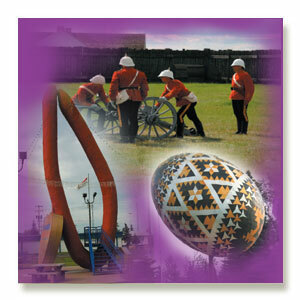 ...Stop in at Vegreville to see the world’s largest pysanka… about 9.5 metres high. A pysanka is a Ukrainian Easter egg. The settlement here is comprised of diverse cultural groups and they are proud of their combined achievements. Mundare, not to be outdone by its neighbour at Vegreville, has created the world’s largest sausage. A statue of their 13 metre sausage is there for your photos. ..